Procedural plugins: renderer specific plugins to render Golaem simulations. Maya opens the scene, and loads the required plugins (at least the Golaem Maya plugin and the renderer plugin). Hence, to be able to render a Golaem Simulation on the Render Farm, all render nodes must be able to load the Golaem Maya Plugin and the renderer specific procedural plugin. To install those, you can use the same installer than the one used to export the simulation. locally (as they could be installed on an artist workstation, see above). Depending on your installation method, the Golaem Maya Module may need to be referenced through the MAYA_MODULE_PATH environment variable in order to be correctly loaded. If using the provided .mod file, the Golaem Maya Module should automatically set the right environment variables for the renderer specific plugins to be loaded. 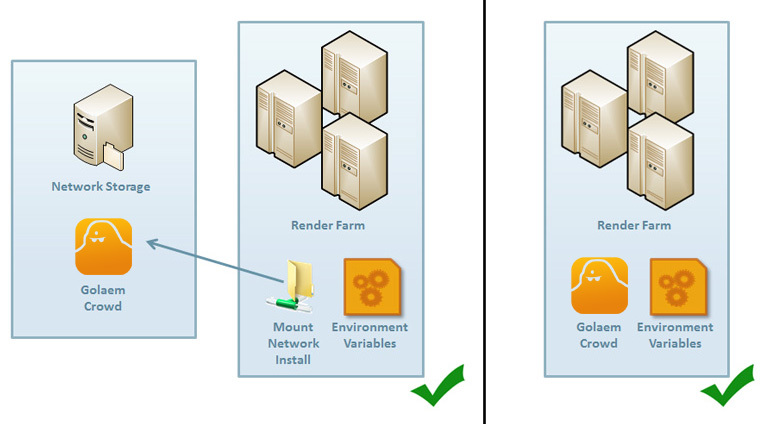 See Configuring Render Farm Manager for a complete description. NB: No license needs to be set for the render nodes (and it should not be set as it will steal tokens used by artist's workstations).